Hmm.. today the passenger window won’t move. It sounds like the relay is operating on the switch but there is no sound from the motor or movement from the glass. With the service centre so far away, I guess I will just live with it. Its too hot right now (110F) to have the windows down anyway. Since the car had almost 10,000 miles on the clock when I bought it, it was about ready for it’s first scheduled oil change. 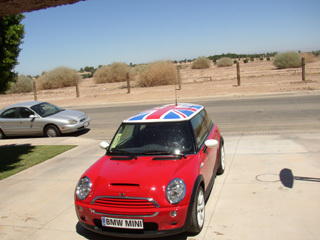 The nearest MINI service centre is Brecht’s in Escondido, about 130 miles away. I was very impressed with the setup at Scottsdale but figured I would see what Brecht was like before deciding whether to make the long drive east. During the previous week, Sarah had come very close to overheating whilst waiting at the line for the car wash. The needle had gone almost all the way to the top whilst ilding; a speedy exit had fixed it. So I wanted Brecht to take a look at the cooling system. When I checked in for the service, the rep was fairly off hand. They were too busy to look at the cooling system (even though I had told them about it when I make the appt), especially if I was going to wait for the work to be done. I sat in their lounge for a couple of hours and was told the car was ready. They had done a quick check of the cooling but other than the fluid being low they didn’t see anything obvious (such as the fuse being out). I had gone less than a mile when the flat tyre light came on so I went back and had it checked out. No flats, so they reset the warning light and I went home. The MINI definitely turns heads, especially out here when most people have shiny huge trucks, the cute stylish MINI looks somewhat out of place. I get lots of admiring glances, or rather my MINI does, as we drive around. Still getting used to the clutch and those low torques but it certainly is a heck of a lot of fun to drive. 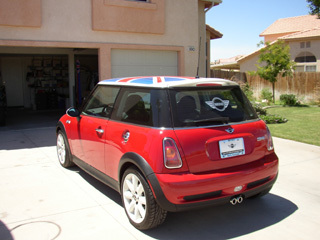 My wife and I set off to Scottsdale early in the morning, the cell phone on in case Debi calls to say that the MINI has gone. What a bad feeling that would be! We get to the dealer around 10.30, go up the lift to the showroom and there on the lot it is – it’s still there and it looks perfect! A short test drive, lots of paperwork and waiting around later and I am on the freeway in my shiny new MINI, who I have instantly named Sarah in honour of my old Peugeot 205 which I loved. I’ve only gone a few miles and a velvet red MINI pulls alongside, the driver waving and smiling; I can’t help to do the same back. It sure is a long drive back to Brawley but the MINI is surprisingly comfortable and certainly nippy enough to make good progress. The cruise control acts oddly, no matter what I set it to it always starts 5mph or so less, eventually gets to what I set it to but after a while wanders around. The low torque is difficult to get used to, you wouldn’t think I have driven a manual car all my life from the way I am pulling away.